When will the recruitment market in Ireland turn around? The fact is that recruitment in Ireland is still very much alive. It might be hard to believe since you are bombarded with the news about job losses every day. Check the Jobs News site for the published news about jobs in Ireland. But the reality is that the vast majority of the Irish workforce is still working. The Irish companies are still doing what they have been doing before the crisis. A large number of the companies have made some staff redundant, and those have been the staff that are not triticale to the operations. If company can get their product out with 20% staff reduction, they did it in the last few months. The words like efficiency and productivity finally got their meaning now. The end result is actually going to be good for the Irish economy. We will get more productive workforce. The people who lost their jobs will eventually find a job somewhere else or start their own business. This is what we are good at in Ireland. The next result is that we will eventually bring our prices down. January 2009 was the first month in the long time that we had negative inflation, or deflation. And we need a quite a few more months like that. That will drive the prices down. Cost of living will be balanced with the rest of Euro zone. We will stop going shopping to Northern Ireland, because ‘everything is half price up north!’. Ireland will become competitive. We do need this process of restructuring of our companies, and if we do it right we will come out stronger. I know that this sounds a bit like David McWilliams. 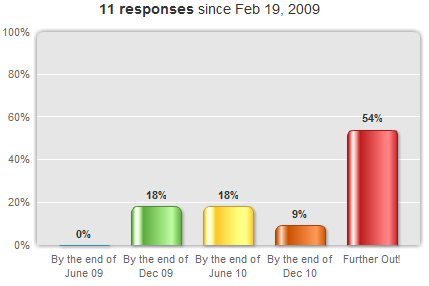 But guess what, the Microsoft Recruitment Poll results are even less optimistic! More than half of the people think the recession is to stay here for MORE THAN 2 YERS! 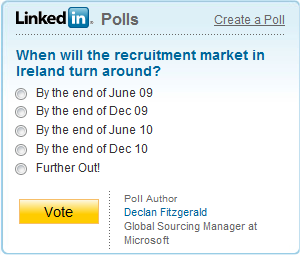 Posted on February 23, 2009 Categories Career, Jobs, Microsoft, RecruitmentTags Microsoft Ireland Poll, Microsoft LinkedIN Poll, Microsoft Recruitment Poll, Recession in Ireland, Recruitment Market in Ireland1 Comment on When will the recruitment market in Ireland turn around?